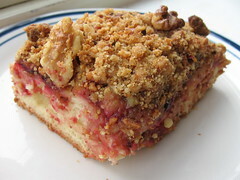 German Plum Tart - Do You Know The Muffin Man? Notes: I baked this in a 13×9 baking pan which fit everything nicely. The plums I used were Damson ones, which are small and quite tart. Baking made them even more acidic so a good accompaniment for this is ice cream. My last batch of Crumble SurpriseTM, an odds-and-ends frozen baggie of leftover crumble topping, went into this cake. I didn't like this so much: the bread base isn't flavourful, nor is the topping. Next time, I would chop the nuts more finely and add some spices to the plums.